This 34-year-old movie reminds us of the unforgettable classic Westside Story and the more recent movie, Fruitvale Station. It is based on an actual 1940s Los Angeles murder trial. It involves a group of Mexican American young men who were tried and sentenced to San Quentin Prison for a crime they never committed. The film is directed by Luis Valdez and stars his younger brother, Daniel Valdez, as Henry Reyna, the group leader. The Valdez brothers in real life happened to come from Mexican immigrant families. Daniel also directed the great music, which is an important part of this production along with the wonderful dancing. The music of course is decidedly a Latin blend that fits in well with the intriguing dramatic story. 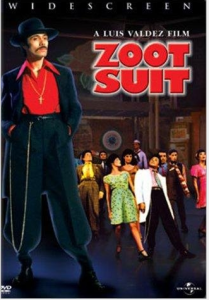 It features an imaginary character, El Pachuco, who is in the mind of Henry Reyna. He is magnificently played as a Zoot Suit wearing devilish persona by Edward James Olmos, who proves himself to be a great dancer and singer, as well as a fine actor. There is another familiar face in the cast who you will recognize, and that is Tyne Daly who plays Alice Bloomfield, who is a young woman working with the team trying to set the innocent people free. This 1981 film about the 1940s could have been ripped from today’s headlines as we see accusations of police brutality and controversial trials. It is a refreshingly different film that is worth seeing on Netflix (1981).